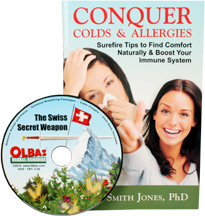 Conquer Colds & Allergies: Surefire Tips to Boost Your Immune System by Susan Smith Jones, Ph.D. - Penn Herb Co. Ltd. Discover simple ways to soothe the misery of colds and allergies and boost your immune system to help prevent these problems from developing in the first place. Dr. Susan highlights specific herbs and natural remedies that will support the immune system and relieve symptoms like cough, congestion, sore throat, and watery eyes. With the safety and effectiveness of many over-the-counter and prescription medicines in question, the best course of action for relieving colds and allergies is to turn to the abundance of healing herbs and remedies in nature's wonderland.